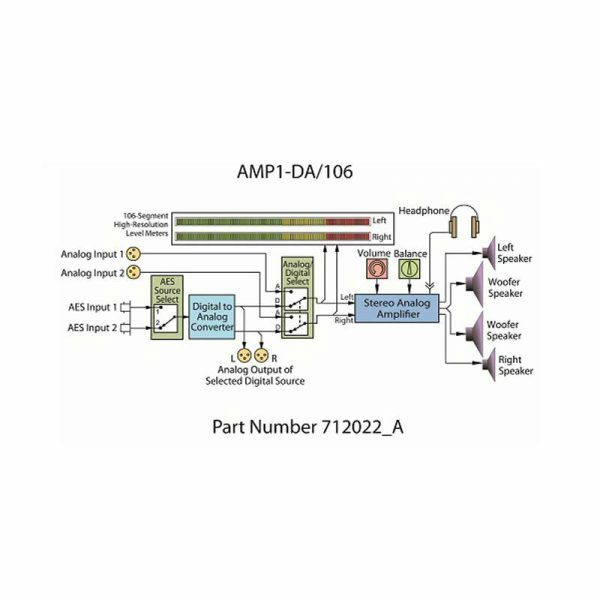 The AMP1-DA/106 provides self-powered, full-fidelity stereo audio monitoring of 2 channels from analog and AES/EBU Digital sources and ultra-high resolution LEDs with 106 segments in the smallest rack space possible. This unit contains four high performance transducers driven by three power amplifiers: one amplifier/driver combination handles midrange and high frequency information in stereo, while the second handles summed low frequency information below the 500 Hz crossover point. The unique design provides optimally focused sound for operators in an ultra near field (1 to 3 ft.) working environment and offers performance comparable to that of many separate monitor pairs, yet does so without the installation hassles, awkward speaker placements and “added-on” look. 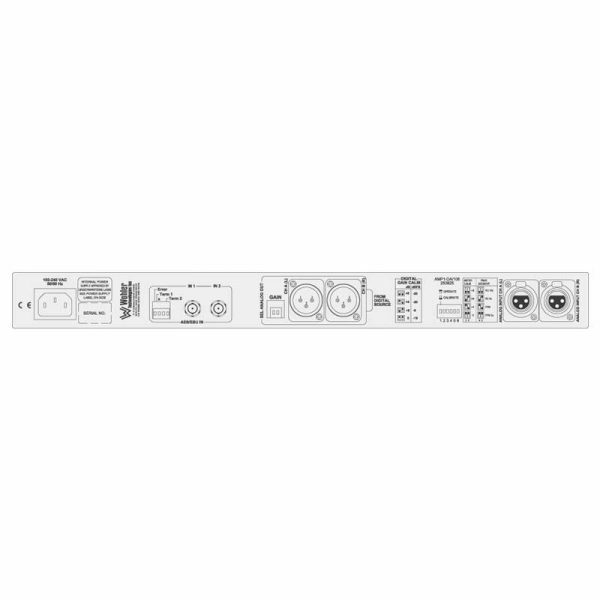 This provides for a higher SPL for the operator while reducing overall ambient sound and adjacent bay crosstalk. The level meters are now available with a choice of BBC, DIN, Nordic and VU scales and PPM Only. Extended HF response reveals potential problems with audio, whine, or hiss. Electronic rather than acoustic cancellation of bass frequencies provides positive audible detection of out-of-phase (reversed polarity) audio feeds. A headphone jack is provided on the front panel, usage automatically mutes the speakers. Output limiter circuits are incorporated to protect the speakers, and extensive magnetic shielding allows placement immediately adjacent to video monitors with no color impurities. Our unique tri-color LED design means we can offer an almost unlimited variety of options such as phase correlation, peak hold, and alternate scales.The standard display mode is set as a single segment PPM “dot” above a VU bar; each segment’s color is fixed according to its position on the scale. Level calibration may be set via dip switches to select one of four different calibration levels. 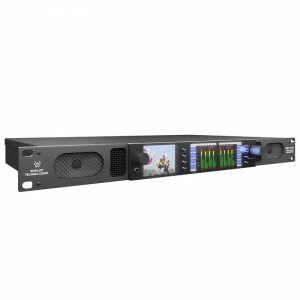 The AMP1-DA/106 is ideally suited for use in VTR bays, mobile production vehicles, teleconferencing installations, multimedia systems, satellite link and cable TV facilities, and on-air radio studios. 16 Channel, Dual Input 3G/HD/SD-SDI Audio Monitor. 1RU. 3G/HD/SD-SDI, AES3, Analog Audio Monitor with 2 Channel Metering. 1RU.